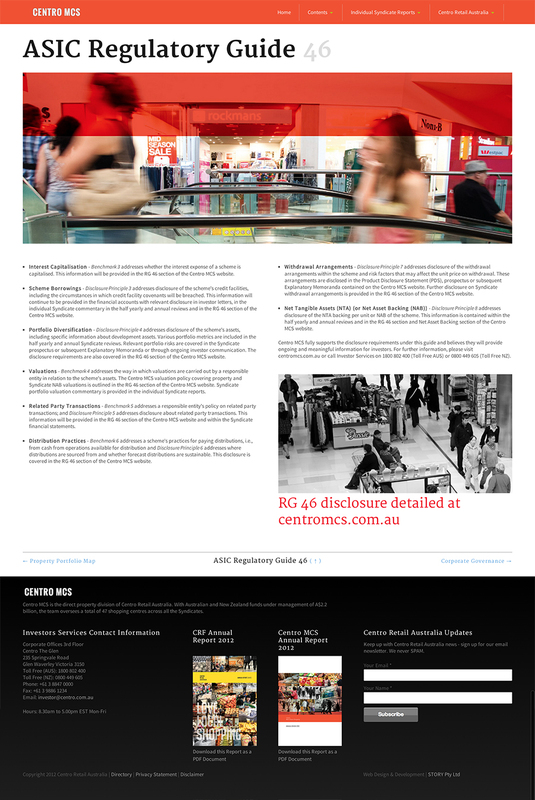 Centro Retail Australia (CRF or the Group) is a fully vertically integrated Australian real estate investment trust (A-REIT) specialising in the ownership and management of Australian shopping centres. With $6.6 billion of shopping centres under management, CRF employs over 500 people with offices in Melbourne, Sydney, Brisbane and Perth. The Story Group built two websites for the Centro Property Group. Both sites contained a large amount of financial data as well as general company information. Being able to navigate to the particular area of interest quickly and easily was of particular importance to the viewing audience. Story built these sites to be fully responsive – working across Smart Phone, Tablet and Desktop systems so that the interface adapts to the viewing platform automatically. The response to the sites has been excellent and usage statistics showed that the viewing audience did drill-down into the content and the sites retained users for a significant amount of time.